I promised to post some videos I took of Kittiwake sailing – here they are. They’re quite big so may take a long time to download (don’t try unless you have broadband) and will only play on very recent versions of media players like Quicktime or RealPlayer. They give you a very good feeling of how fast Kittiwake is (she’s doing about five knots in the videos) and in particular how fast she feels, since Kittiwake has quite low sides (‘freeboard’) and so you’re very close to the water rushing past. One thing I’d like you to notice is how there are no railings on the narrow bow, where you have to kneel to take down the jib. Now imagine doing that as the boat is tossing through stormy waves, when the bow is wet and slippery and steeply sloping, actually digging into the biggest waves. No wonder Eve makes me do that :-). We’ve left Lähteelä and are running down the east coast of Porkkala, bound for Helsinki and home. It’s been a great holiday, with lots of adventure and new experiences. It’s strange to think that it’s been two and a half weeks, although the first days do seem a long time ago. The Turku archipelago was very beautiful, but as Eve commented the islands and coastline around Helsinki are just as good and a lot more convenient to visit. We’re at Lähteelä, run by Helsinki’s park service although it’s in Porkkala, west of Helsinki. It’s a very sheltered harbour amidst beautiful Finnish coastal countryside, and unlike Elisaari from which we departed this morning, there aren’t many mosquitoes. Our day’s sailing began gently enough as we ran down Barosund, and as we passed Vörmö we were going very well, over six knots (and Kittiwake’s ‘hull speed’, her theoretical top speed, is a little over 6 knots). Then as we started to reach across Porkkalan Selkä, the wind just kept increasing. 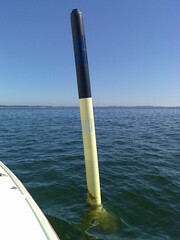 Soon the GPS unit was reporting seven knots, and as we came to Porkkala peninsula it reported 8.4 knots. 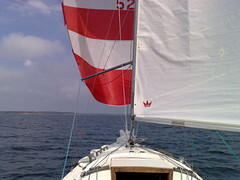 The boat was sailing right at the limit of controllability, and we had to head into wind and remove the jib (me crawling out on the unprotected foredeck, toes hooked over the weather rail for safety as Kittiwake tossed in the five foot waves). 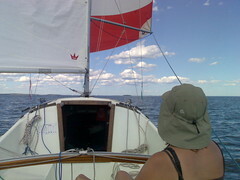 Luckily we got through the narrow channel safely and there was Lähteelä ahead. 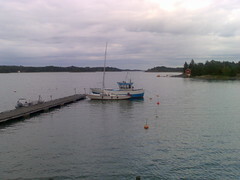 We stopped for a break at a small island called Byxholmen, which has an ‘excursion harbour’ (i.e. mooring rings in the rocks on the sheltered side), as well as a sauna and BBQ areas. 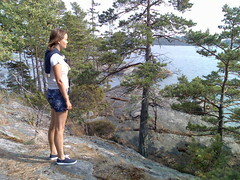 It was a beautiful island, and we saw a couple of fine snakes (too quick to photograph). 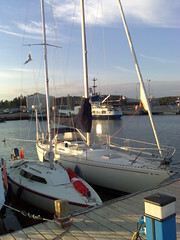 In the boat moored next to us was one of the old sailors we met at Gullkrona, so we got some more spinnaker advice. 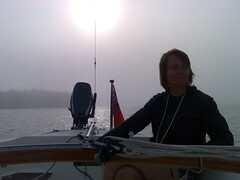 Fog suddenly descended, but with the GPS unit we could still navigate, so we carried on, giving loud toots on our foghorn if we heard a boat approaching. 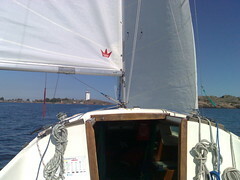 We got some spinnaker advice from a couple of old sailors at Gullkrona, and this time it went up fine. Nearly there – I’d better wake up Eve. Oops – nearly went on the wrong side of this one. Back at Kasnäs on the way home to Helsinki. 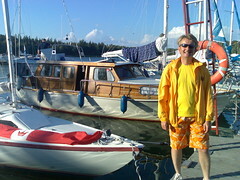 The big boat next to Kittiwake is a Swedish Omega 42, a lovely boat that passed us on the beat up to Kasnäs. We went to Kirjais because a sculptor lady we met at Nauvo promised there was ‘hyvä meno’ (lively atmosphere) at the restaurant there. As you can see, it’s not actually the archipelago’s liveliest harbour. And it rained.